It’s easy to become disheartened with a smaller outdoor space, but it’s definitely possible to create an area that is beautiful and green – a perfect (petite!) garden where you can relax. There’s definitely challenges that come with a smaller garden – privacy, eyesores and walls, but these can all be managed with a bit of creativity and planning. It’s worth a look at Northcote Pottery ​for some fantastic ideas when you’re just starting out. Container planting can make all the difference when it comes to design and character for your garden, while saving on space. Clusters of pots and planters at different heights will make your garden look interesting and will draw the eye. You can also experiment with screens and climbers, and vertical gardens if you’re feeling adventurous. Lighting can also be a great way to add a special touch. 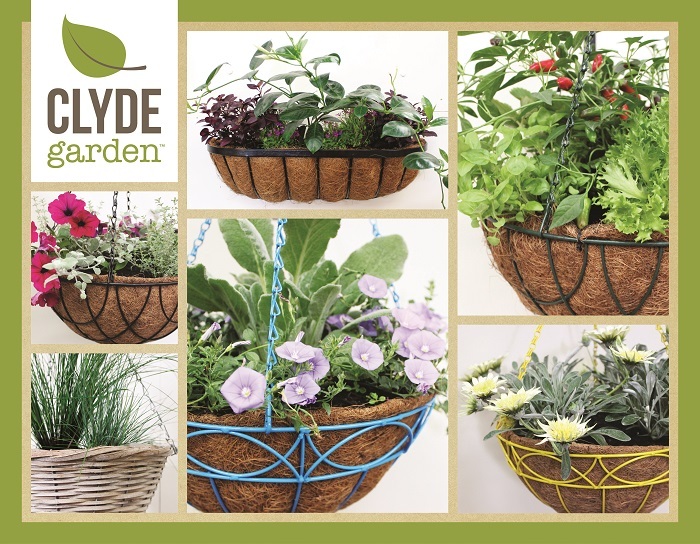 We simply adore the Clyde Garden collection of hanging baskets from Northcote Pottery. Your choice from the classic and elegant, to the sleek and modern, all the way to the fun and quirky Carnival baskets! There’s an option for any style garden and any sized space! When designing a small garden, begin with a surface to step on to from the door. This is often well-worn from high traffic, so decking or paving may be best. Geometric shapes or even a change of hard surfaces can be really effective if done well. If you’re laying pavers, try diagonal patterns to give the illusion of space. Comfort is key in a garden – some seating and a table are great additions. Bench seating works really well in a small garden because it is an excellent space saver and will create an open look. Try putting a table and chairs in the corner of the yard to free up a lot of extra area. If you wish to use your small garden for entertaining, keep it as open as possible. Don’t make the mistake of throwing a feature in the middle of a small space where it can be difficult to manoeuvre around it. Try putting a feature at the back of your garden for a feeling of depth. Also consider its position for views from the windows. Looking out onto a particular garden feature can bring an extra touch of harmony between the home and garden. Just imagine looking out onto a beautiful Northcote Pottery pot, planted up with a feature plant! Choose plants that will give you height, and also have a compact habit. The more edges you can cover with plants, the more relaxing you will make your space. You’ll find that a little garden does not have to equal dull or cramped. With a bit of design and planning, you’ll have a tranquil haven that you can enjoy with your friends and family.